President Trump said Tuesday that the corporate tax cut he signed into law will mean more money for ordinary Americans. 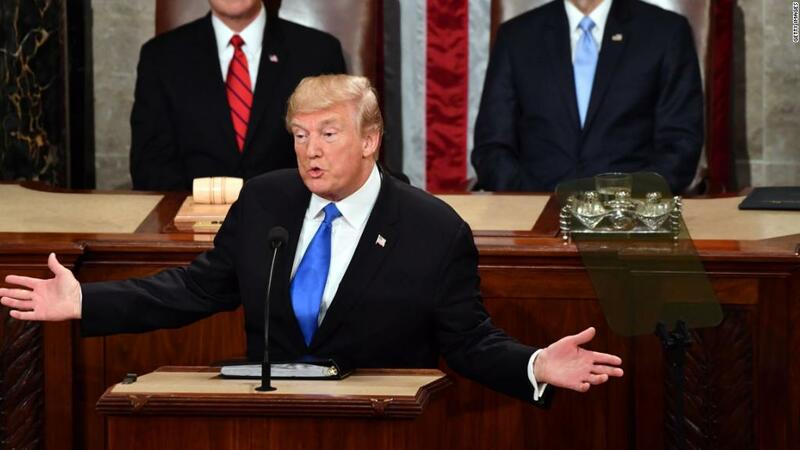 Thanks to the big drop in the corporate tax rate -- to 21% from 35% -- U.S. companies can now "compete and win against anyone in the world," Trump said in his State of the Union address. "These changes alone are estimated to increase average family income by more than $4,000." That figure is actually an estimate from a report this past fall by the White House Council of Economic Advisers, which assumed a corporate rate of 20%. The idea behind the $4,000 estimate is this: Corporations will use their new tax savings to invest more in their companies, create more jobs and pay higher wages. The $4,000 estimate is at the very high end of the range of what is considered possible. Most economists agree that "well-designed tax changes can improve living standards over time," said Donald Marron, director of economic policy initiatives at the Urban Institute. But, Marron added, experts generally think the boost to income from the new tax law "will probably be much lower than $4,000." Moody's Investors Service just last week said, "We do not expect corporate tax cuts to lead to a meaningful boost in business investment, which has remained tepid despite a supportive economic environment." Instead, the agency believes U.S. companies will mainly spend the money on things like share buybacks, acquisitions and paying down debt. Any positive effects on family income resulting from the corporate rate cut may take years to materialize. Most economists and market experts agree the biggest benefit in the first couple of years is likely to go to shareholders.